Or at least that we found this weekend. Apparently Coach was telling the truth when he wrote in his autobiography that he and Howard Schnellenberger were comfy enough with each other to carpool together during their days at Bama (they were across-the-street neighbors dontchaknow). 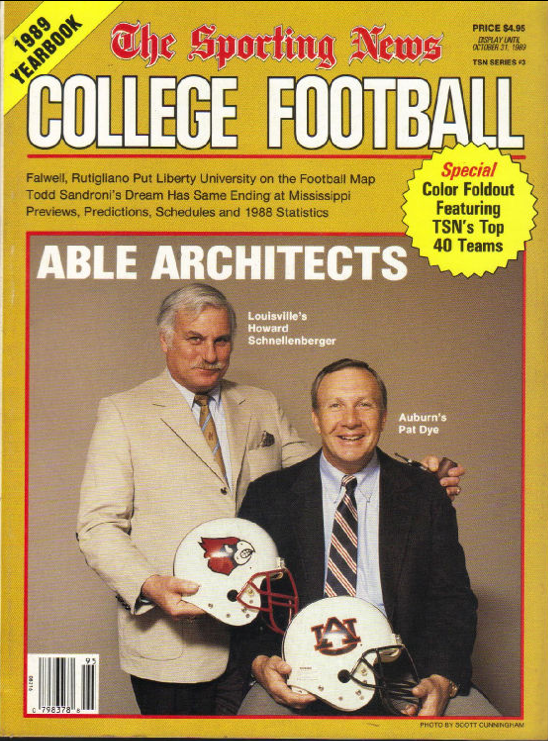 Because they apparently were also comfy enough for Schnellenberger to pose with his pipe hand on Pat’s shoulder for the cover of the Sporting News’ 1989 College Yearbook—that’s a big deal. Schnellenberger keepin' his pipe hand strong with Coach Dye in 1989. We're assuming the pants were airbrushed in. Had we discovered this in time, it would have obviously topped every TWER story related to the Florida Atlantic game. But since we’re not sure if we even had a post related to the Florida Atlantic game, now is obviously as good a time as any to share it. Related: Pat Dye buys sunglasses / Pat Dye builds a fence.